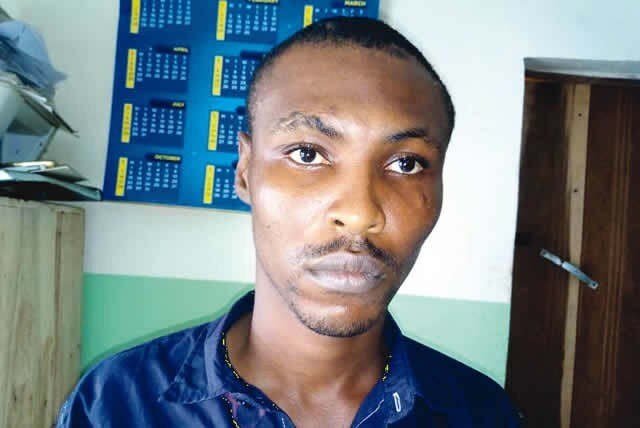 23-year-old Chijioke ' Ogbotiti' Ogbonna who was arrested by the Operatives of the Federal Special Anti-Robbery Squad in Imo State was paraded by the police last Saturday. While speaking to newsmen, the alleged notorious cultist and killer said he had killed three persons since he was initiated into the Black Axe confraternity in 2014. According to him, his resolve to seek revenge led him into killing three persons, one of whom was a member of a rival cult group. Ogbonna who is an indigene of Umuejije, Isialangwa South Local Government Area of Abia State, explained that his main weapon was a locally-made gun. The Police Public Relations Officer in Imo State, Andrew Enwerem, described the suspect as a deadly cultist and armed robber, adding that Ogbotiti was nabbed by F-SARS operatives on August 19 at Ama-Hausa in the Owerri Municipal area of the state capital. Enwerem told Punch’s correspondent that the police had been on the trail of the suspect since 2014 for his alleged roles in other criminal activities. The police spokesman said, “The suspect, a strong member of Black Axe, confessed to the crimes. He mentioned their gang members, nicknamed as Efizy, Ikalika,Shinshi, Bulldog, Baggy, Sky, now in Owerri Prison and X-money killed in an operation. “He also confessed that they were the gang that killed one Michael, a student of Nekede Polytechnic, in 2015. In the same year, they killed one Mgbele on Douglas Road in Owerri and one Ifeanyi, a student of Nekede Polytechnic, in 2015.